Undertake a Literature Review on ‘Strategies for Building Organisational Commitment’. The review is to focus solely on refereed academic publications (i.e. journal articles). Assignment ‘Coversheet’ (document is available in the Assignment file on Blackboard). 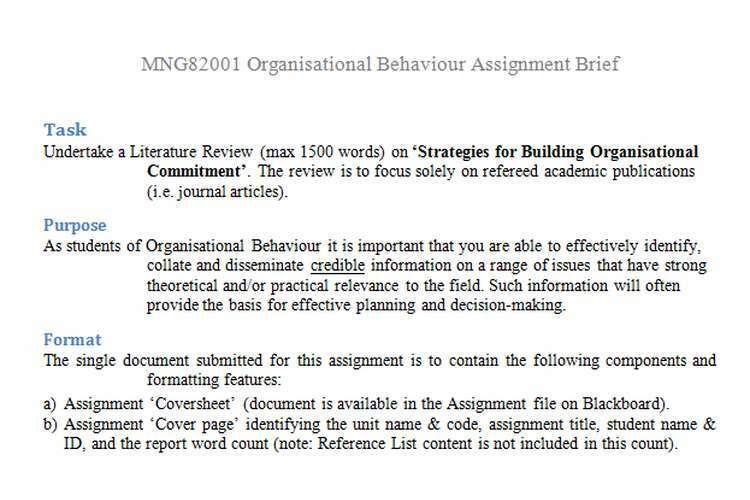 Assignment ‘Cover page’ identifying the unit name & code, assignment title, student name & ID, and the report word count (note: Reference List content is not included in this count). Both in-text and reference list skills must be demonstrated (use the Harvard Referencing style). Margins: top and bottom to be 2.54cm. Left and right to be 2.54cm. No page boarders. Spelling: if using a Microsoft package, specify Australian English language/grammar when running your spell-check. All assignments are to be submitted through’ Turn-it-in,’ which can be accessed from the ‘Assignment 1’ folder on Blackboard. The link will be activated in week 4 and you can submit the assignment any time up to the due date. Students who submit their report by the due date will receive feedback within 2 weeks. This feedback will be in the form of a marking rubric and a copy of your report with electronic comments from the marker.